If you want to enjoy your Range Rover’s performance and spend less time in car service shops, you should maintain it properly. Actually, if you tend to your Range Rover and stick to the rules in the book, you will be able to enjoy the experience of one of the most reliable cars in the world. Today we are going to talk about a very important aspect of Range Rover maintenance – the exhaust filter. Maintaining a Range Rover exhaust filter is a straightforward task and it will only take a little bit of your time. On top of that, we will share a few tips on how to keep your Range Rover Exhaust Filter clean over longer periods of time. But, before we start, we have to tell you what an exhaust filter is and why it is important that you maintain it. Let's start, shall we? What is the Exhaust Filter? The Range Rover’s diesel engine efficiency, thus your vehicle speed, performance, and driving experience depend on how clean the exhaust filter is. Land Rover introduced this filter back in 2009 when strict emissions regulations were introduced by the worlds largest countries. This filter is also known by the name Diesel Particulate Filter, or simply DPF. While you drive your Range Rover, it produces all sorts of gasses and particles. DPF’s main role is to capture and store these substances. In the end, your car will be more environmentally friendly as it will have lower tailpipe emissions. There are many lights on Range Rover instrument panel. You must learn to read them if you want to successfully maintain your vehicle. When it comes to how to maintain a Range Rover exhaust filter, the first step is to track the DPF indicator. 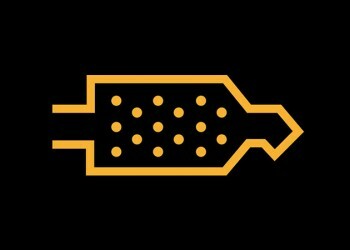 If you see a DPF amber warning light on your dashboard, it means that the DPF filter regeneration is required. To clean the filter, drive 20 minutes at speed no lower than 60 km/h (37 mph) for 20 minutes. If you don’t follow these instructions, the regeneration process will not be completed and you may experience changes in the vehicle’s performance and your driving experience. It’s important not to interrupt the process to avoid causing any additional problems. Regeneration will unclog your DPF completely. If you see this indicator, you should stop your vehicle when it is convenient. This light indicates that there is something wrong with your DPF. You will need to contact your nearest Land Rover Retailer to make certain arrangements to ensure your and your vehicle’s safety. The green light kicks in after you successfully start and complete the regeneration procedure. By driving your Range Rover for 20 minutes at a steady speed, you will allow the car to burn off the excess particles collected by DPF and your filter will be completely clean. There is no need to continue to respect the suggested lower speed limit and you can drive your vehicle as you want. During the DPF automatic cleaning process, you will experience a slight increase in fuel consumption. This will go back to normal once you see that warning light turn green. Range Rover vehicles are equipped with technologies and systems that enable them to automatically clean the exhaust filter. As we have stated earlier, when you drive your car, the car’s engine burns the fuel and produces exhaust gasses. These gasses contain all sorts of particles, all of which get captured and collected by the exhaust filter. A Range Rover is smart enough to recognize when the filter is dirty. If this is the case, your vehicle will automatically start cleaning the exhaust filter. This process is conveniently named regeneration. In most instances, your car will maintain the filter automatically, but it is also important to know that the success of the regeneration process depends on the car’s temperature. During the regeneration process, your Range Rover will increase the temperature in the DPF to burn the collected particles and clean the filter. Also, it’s normal to feel excessive heat coming from beneath the vehicle during this time. But since you will be driving at that point, the chances are that you are not going to feel it. Just make sure not to drive your vehicle across any fields with dried grass. The regeneration process kicks in every 300 to 900 km (190–560 miles). It depends on what the car is used for and other driving conditions, and it lasts anywhere between 10 to 20 minutes. During the regeneration, you should drive steadily between 60 km/h and 112 km/h (37 mph–70mph). The best way to ensure safety and steady speed is to hit a motorway or the main road. Which Driving Styles Are Bad for DPF? If you drive your Range Rover in these conditions, you will see that Amber Warning Light turning on more frequently and you will need to drive your vehicle to a highway or some light traffic road where you can kickstart the regeneration process and drive until your DPF is completely clean. When you DPF Amber Warning Light turns on, make sure to drive your car for at least 15 minutes at 60 km/h (37 mph). During this time the regeneration process will do its job and your DPF will be clean. Some experts advise staying away from biofuel diesel because it may clog your DPF at a faster pace. And, finally, make sure to always use the exhaust DPF fluid specified and compatible with your Range Rover. Hopefully, we’ve helped you learn how to maintain a Range Rover exhaust filter. As you can see, it’s not a hard thing to do.